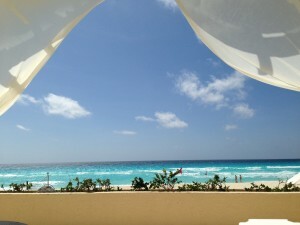 Looking for a non-spring-break experience in Cancun? We found it! 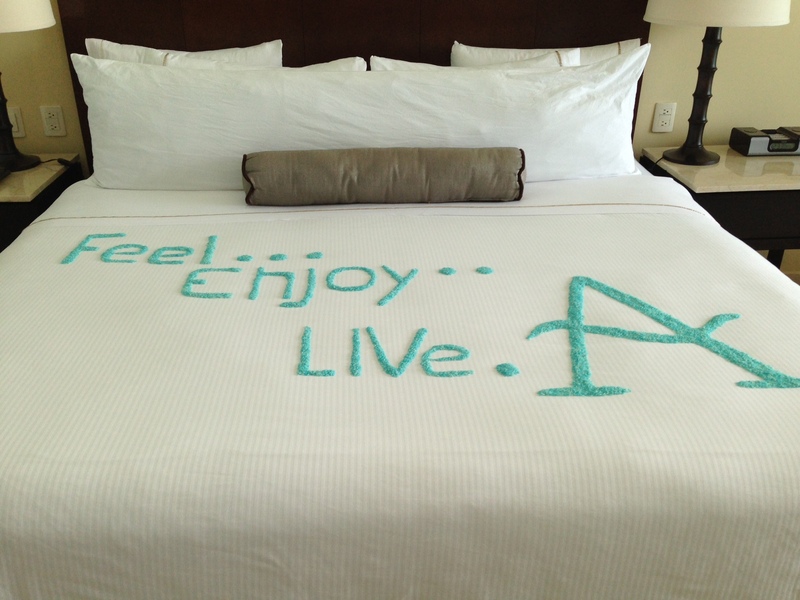 Live Aqua is an adults-only all-inclusive resort that focuses on relaxation in the famous Mexican city. Whether you’re looking to take a break from the deadlines and stress of work, or you and your honey want a romantic vacay, consider this resort for a fun getaway. Cancun is known for its aqua-colored ocean water and white sandy beaches, providing a treat for your senses whether you’re sitting on your balcony or the ground. On the other side of the hotel is a lagoon, which you look out onto as you walk out of your room. (Tip: If you have access to the Aqua Club, have a glass of wine and watch the sunset from the balcony overlooking the lagoon. Picture perfect!) And while there’s not really a reason to leave the resort, if you feel like journeying outside, there is an outdoor mall right across the street as well as access to other off-site activities such as snorkeling, golf, and Mayan adventures. From the moment you check in, you are greeted with ultra relaxation — a hand massage from a friendly staff member — while aromatherapy and soothing music pump throughout the lobby. The relaxation continues in the spa area where they offer many services including massages, facials, and baths. And if you’re cheating from the whole relaxation mission, there is a gym and business center if you must…. 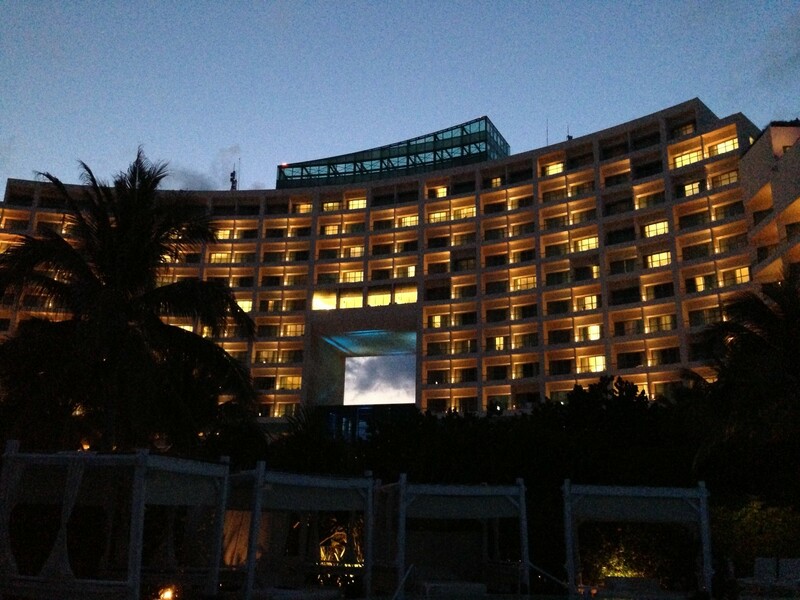 The resort has a few pools, including an infinity that looks out onto the sea and one that has a swim-up bar. There are private cabanas for your use as well. If you aren’t staying in a suite that includes it, you can reserve one for $50 a day (and that includes a foot massage). Activites are also available throughout the day, such as yoga, wine tasting, and a guacamole-making class. They also host evening events on the beach. We went to the fire show and enjoyed watching locals perform while we sipped cocktails and noshed on hors d’oeuvres. While all-inclusives sometimes get a bad rap for mediocre food, Live Aqua impresses. Siete is a cafeteria-style restaurant that we recommend for breakfast. Azur, which sits on the ocean, is perfect for lunch, especially since it’s right next to the pool area and allows for outdoor dining. And MB is an ultra romantic spot serving super delicious latin cuisine featuring the trendy molecular gastronomy technique used for the core of the recipes. If you’re looking for the ultimate relaxing vacation where all of your senses are stimulated, Live Aqua Cancun is the perfect place. Ideal for couples, this resort will have you experiencing the spring-break capital in a completely different (and definitely more mature) way. To find out more about the resort or book your stay, click here!